Guilt is a sobering emotion. All of a sudden, wrong doings committed, less than favorable acts performed, all is brought to the forefront, ensuing self-doubt, self-reflection and possibly, ultimately change. 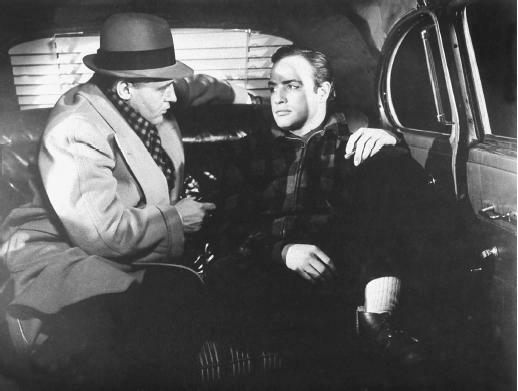 On the Waterfront shows us a man who’s neither good nor bad. He’s a man who’s been caught up in an unfortunate series of events and has to live with them. Repentance and forgiveness are hard earned, and sometimes it’s easier for a man to take a path of shadow and crime, rather than a path of virtue where all past mistakes are brought into light and evaluated. Does an individual take the easy way out? Or do they strive for something greater? Terry Malloy has been caught up in the mob, brought in by his influential older brother Charlie. He runs errands for the boss of a workers union, Johnny Friendly until one day, aided by some of his actions, he witnesses murder. His guilt leads him to the sister of the dead man and she directs him to Father Berry, who urges him to give courts information that will help prosecute the mobsters. I never really understood the Marlon Brando love until this film. Granted, I was judging him unfairly due to the fact that I had only previously seen one film with him in it, a film I openly hold disdain for – thank you Apocalypse Now for taking three hours of my life away. However, On the Waterfront has officially put him in a favorable light in my eyes. I get it; I get the reason why people would rush out to see his films, would herald him with praise and accolades. In this film Brandon managed a naturalist charm with ease, and more surprisingly considering his berth and appearance, he pulled off a vulnerable, sympathetic character. It was Karl Malden as Father Berry and Lee J. Cobb as Johnny Friendly who ran away with many of the scenes they were in. Cobb, who I knew from 12 Angry Men, was delightfully villainous. While one of the more over the top performances, it fit with the character. He was dastardly and devious and fun to watch. Karl Malden stole the show though. There was nothing about his performance that set him apart from modern performers. He embraced subtleties and gave a nuanced and passionate performance. The major issue with this film is not its storyline nor it’s acting, but it’s pacing. The movie dragged until around the half-way point until Father Berry gave his impassioned speech at the feet of another dead man at the hands of the mob. From then forth the pacing of the film noticeably quickened and my interest increased. Any scenes involving Terry’s romantic subplot dropped in quality. The most effective scene in the entire film was when Terry came across Charlie’s body. Here we’ve been told that Charlie is this big, tough guy, a man to be frightened of, yet he laid his life down for his brother. He sacrificed his well-being in order to protect his one hope for redemption. Charlie had nothing going in his life. He was a criminal, he was sought by the law, and he had reached his ceiling of opportunity. Terry on the other hand still had hope and Charlie saw that. So in order for his brother to seek a better life he gave up his. Seeing Charlie, big, bad Charlie, hanging from the hook on the wall is a haunting scene and was shot beautifully by director Elia Kazan. At first it’s just a lone figure and then the car drives by and the headlights illuminate the body, a body that no matter its size or intimidation in life , is still only flesh and blood in death, not invincible to bullets and pain. As Terry takes him down from upon the wall, struggling all the way, the emotional complexity caught me by surprise. Terry is broken now, he’s lost his protector and the man who he looked up to, and in blind rage he chooses to avenge him. However, he doesn’t leave before making sure that he won’t be alone and it’s that moment that truly exemplifies the great writing of this film. 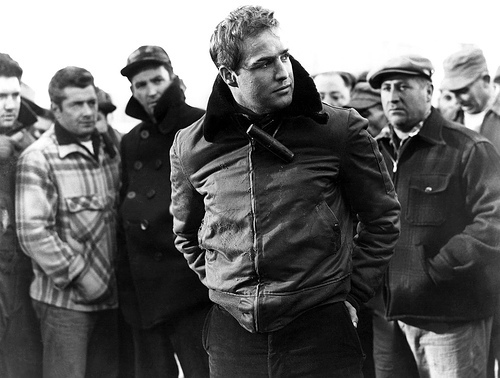 Brando on first viewing seems tough and a stoic figure, yet in reality of this film he’s haunted, he’s lost and he’s vulnerable to those that hurt him and do him wrong, holding a naivety about the world. Every punch thrown his way, every harsh word seems like it shakes him to his very core, he is not impenetrable. So no matter his failings or shortcomings he is sympathetic and watching him have to lay his brother down is heartbreaking. This film is about redemption. It’s about a man who, unbeknownst to him, has fallen to his lowest point. He used to have a dream about being a fighter, of being a champion, and now he works with mob mosses and men who would put him in harm’s way if they got a good deal out of it. This film follows the narrative of a man who’s seeking comfort in stability, who’s seeking the image of masculinity, it’s at it’s a core a story about what is right and what is wrong and how do you define the two. Terry must grapple with that thought throughout most of the film, struggling with his loyalties and expectations. Everyday individuals are faced with moments in which they can choose the easy route, or the right route. Every choice has complications and benefits and in this case, Terry chose the path of redemption and along the way loses his brother, loses faith, and is beaten until he can hardly stand. Yet he perseveres and marches his way past people who mean to see him fail. Yet at the end, he’s given his penance, he’s given up things that brought him happiness’ in order to obtain a better life. Life is about what an individual gives up, whether forcefully or gratefully, and the consequences of the actions taken. While not my favorite film, it does a good job at showcasing the complexity of decisions, and how the while it the right choice seems like the obvious, it’s rarely the easiest. Next ArticleBook News: Richelle Mead's Bloodlines #4 Gets a Title & New POV!